UNIVERSITY OF PADOVA - DEPARTMENT OF PHYSICS AND ASTRONOMY "GALILEO GALILEI"
Our group is actively involved in many projects, both in observational and theoretical fields. In the table below, a schematic resume of these interests is presented. The ESPG group (part of it). G. Piotto (behind), L. Malavolta, G. Lacedelli, M. Montalto (behind), D. Desiderà, E. Manthopoulou. 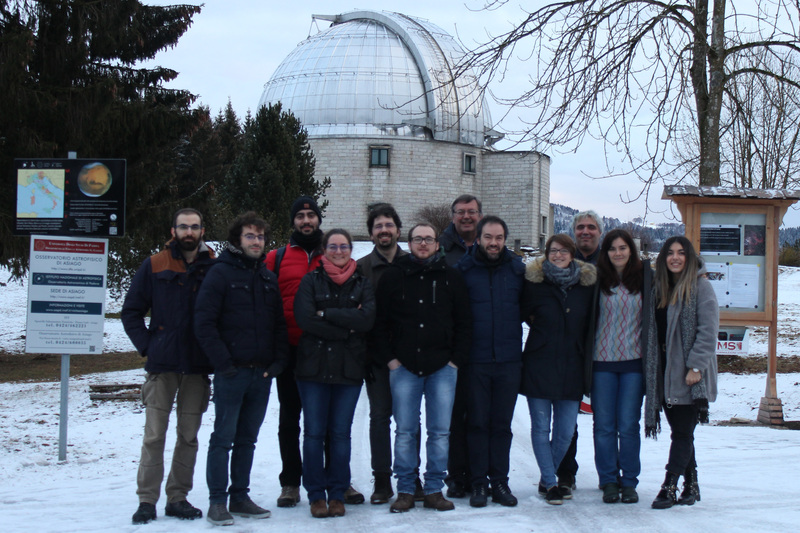 On the background, the dome of Galileo telescope in Asiago (VI - Italy) Astrophysical Observatory (Asiago, 2019-01-18). Just over twenty years after the discovery of the first exoplanet, 51 Peg b, thousands of planetary systems have been discovered and studied. The properties of the identified planets points towards a large diversity, whose origin is still unknown. We are still at the beginning of a huge, fascinating work that is now entering the phase of characterizing the structure of the exoplanets, their atmospheres and modeling of the formation mechanisms. All the projects are illustrated in more details in section Exoplanets. The Globular Clusters are the oldest objects in the universe for which we can give a precise estimate of the age and obtain fundamental information of the primordial universe. In the past, it was believed they are composed by simple stellar populations, i.e., stars with the same chemical composition, formed in a short temporal interval. Our group, world leader in this field, has shown that these objects contain many distinct stellar populations, characterized by different light elements content. All the projects are illustrated in more details in section Stellar Populations.